Mitzi & Jeff’s bridal shower had a really cute spice and recipe theme. We were all asked to bring a spice and a recipe with us to help start their collection. I, of course, never do anything the right way. I couldn’t think of the perfect spice or recipe but then decided on my Chai Tea Cookies. Mitzi and I lovingly refer to each other as our “Cookie” so it was appropriate. My spice was chai tea (which would be a conglomerate of spices) and I chose to package some of my favorite chai tea bags from the indian store that I always make my mom buy for me! I also included a baggie of crystallized ginger and my recipe for the cookies. I thought for awhile about how to package this gift, and originally thought I would make two little pouches and them put them in a box. 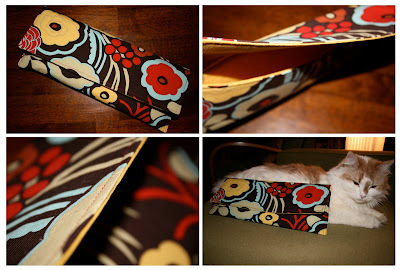 Then I decided to make one big one so she could reuse it as a purse/clutch. So here is my finished product. I really love it and can’t wait to make more. Since I am horrible at cutting straight lines without that ruler board thing I need to purchase, I accidentally made it a little wider on one end than the other. When I was figuring out how to sew the last portion, I decided to keep the edges straight which would allow the clutch to have more room inside for stuff (and would potentially allow the top flat to fold over a bit easier once the bag is filled) So that worked out pretty well I think. I didn’t attach any buttons, however next time I make one I should probably use one of those magnetic snaps. Here’s the clutch! It’s a simple design that could probably use some tweaking in the future, but I still like it. Probably my best project to date! It’s exactly 12 inches (1 ft) in length- I took a picture with Coco so you could gauge the size of it. This entry was posted on January 31, 2010. It was filed under Bags, Sewing. I am so proud you are a busy lil bee! Hi, this is Sofia's cousin, Fayelle – she gave me your link as something I might like to peruse… Holy cow you're such a sewing wiz!! I'm so impressed with everything on here! Thank you!! That was super awesome of her to send you the link. I just started sewing, so you will notice that my stitching is horrible. But I'm always looking for creative things to make, so at least the ideas will hopefully never be boring!! Hopefully I will get better at making everything too. Thanks for checking out my blog! !